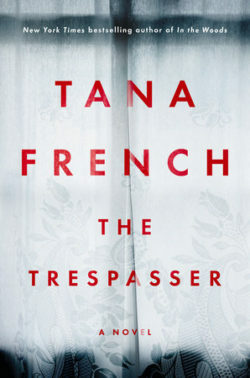 Mystery novelist Tana French talks about her latest book in the Dublin Murder Squad series, The Trespasser. Then, how can we best confront the terrible uncertainties of a darkening future? We talk with Shaun Chamberlin about the late David Fleming’s book, Surviving The Future, which Chamberlin edited and brought out after Fleming’s death. American Irish writer Tana French has been called “the most interesting, most important crime novelist to emerge in the past 10 years.” Her novels are intimate explorations of character and motive, told in vivid language that fairly leaps off the page. Each one takes a different detective from the Dublin Murder Squad as its protagonist, preserving the setting of the series but changing the frame. Her latest in the series is The Trespasser. Its protagonist is Antoinette Conway, the only woman on the squad. She’s also multiracial. She’s smart, tough –and she has a huge chip on her shoulder. Is it because she is the victim of racist and sexist harassment from her co-workers? Or does her pugnacious defensiveness create her isolation? Meanwhile, she’s got a tough case to solve that just might implicate someone in the murder squad itself. Tana French is the author of five previous novels in the Dublin Murder Squad series, including The Secret Place, which we talked with her about in 2014. She is the winner of the Edgar Award and the Irish Book Award for Crime Fiction, among others. The Trespasser is published by Penguin Random House. As this show is being produced, world climate negotiators are meeting in Morocco to discuss implementation of the Paris Climate Accord signed earlier this year by the US and many other countries. 2016 has been the hottest year on record, the third such record-breaking year — and next year is predicted to be even hotter still. But on January 20, a climate denier will become president of the United States. Many of us who think about the the future and the grave threats to it that climate disruption —and other environmental failures— pose are in a state of despair. But we really can’t afford to wallow in it. We’ve got to roll up our sleeves and redouble our efforts to create a livable future for ourselves and our children. Shaun Chamberlin is a central figure in one of the international movements that is creating that livable future, the Transition Towns movement and author of The Transition Timeline. Chamberlin was a good friend of David Fleming, a great thinker and writer on environmental issues in the UK and a leader in the transition towns movement. 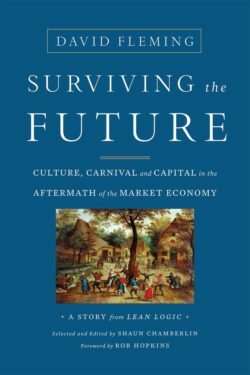 Fleming died in 2010, leaving behind a voluminous collection of writings that Chamberlin has edited and published in the form of two books, Lean Logic and the one we discuss in this episode, Surviving The Future: Culture, Carnival and Capital in the Aftermath of the Market Economy.